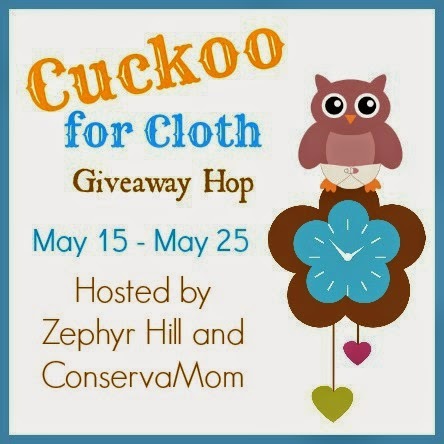 The 2nd annual Cuckoo for Cloth giveaway event, hosted by Zephyr Hill Blog and ConservaMom, starts today! It's a fun way to visit lots of different cloth diapering bloggers and enter to win some wonderful prizes. The grand prize package is worth over $150 and includes items from Funky Fluff, GroVia, Wink Diapers, Margaux & May, Zookaboo and Geffen Baby! Aww, summer! Time for summer picnics, get togethers and of course, swimming! What little one doesn't love to spend time splashing about! But for the little one who is not yet potty trained there's that small issue of diapers in the water. So you head to the grocery store to pick up a pack of diapers made just for swimming. But have you ever actually tried a disposable swim diaper? Back when my son was a baby, we were given some and to be honest, I hated them! They seemed stiff and uncomfortable. They were less than pretty to look at. And they were expensive... especially if you are like my kids and in and out all day. One dip in the pool and the diaper was done. One run through the sprinklers and that's money down the drain! I don't know about you, but I'd rather spend my extra summer money on treats from the ice cream truck than on diapers!! 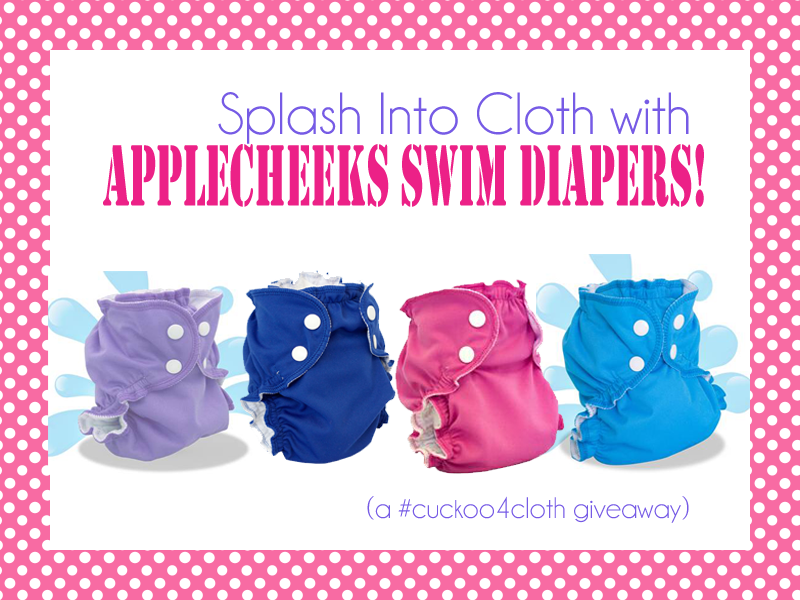 Is it any surprise that even those non-cloth users find themselves looking into cloth options like AppleCheeks Swim Diapers for their summer fun! How do swim diapers work? This is a great question, because honestly, if a diaper is supposed to absorb liquid, would it not get full and heavy as soon as baby gets in the pool. With a regular diaper, absolutely!! So, what makes a swim diaper different? Where a typical everyday diaper is meant to absorb liquids and prevent leaks, a swim diaper only needs to keep solids inside the diaper and out of the pool. Why choose cloth? Do I have to be a cloth diaper-er to use cloth swim diapers? We could go into all of the reasons on why cloth diapering in general is a fantastic option (better for the planet, etc), but let's just keep it simple: THEY'RE CHEAPER! Buy it once and use it over and over and over. When you're done, toss it in the wash and it's ready for next time. No more heading to the store to buy more diapers, one or two are all you need! As a cloth diaper-er, of course, this is the most natural option... but even for those who use disposable, it's ideal too. In fact if you've been curious about cloth but hesitant to start, it's a great way to get your feet wet. You'll enjoy the savings and benefits of cloth, but without the pressure! Afraid of laundry? No big deal! Because swim diapers don't contain PUL, you can just toss them in with the rest of your swimming wear! Super easy! We personally love AppleCheeks for their unique envelope design that is super soft and very comfortable for my little girl. They used that fantastic design to design the perfect swim solution. Rather than PUL, the swim diaper features two layers of 100% polyester Canadian-milled mesh that allow water to move in and out of the diaper comfortable while keeping any messes in! Their signature two-size system with snaps at the waist and separately adjustable snaps at the thigh means your little one is guaranteed a comfortable, long-last fit. Size 1 fits babies from 7-23 pounds and the Size 2 fits babies 18-35 pounds! With wide size ranges, it is likely that the diaper will last you all through the summer, and possibly for several summers to come! Winner will be contacted via e-mail after giveaway ends, and will have 48 hours to respond before a new winner is chosen. One entry per household, winning entry will be verified. Odds of winning depend on valid entries received. A Modern Day Fairy Tale is not responsible for prize delivery.The Zephyr Hill and ConservaMom blogs are not responsible for prize fulfillment. Please refer to the terms and conditions particular to each giveaway. Good luck and have fun! I loved the old Wild Child print! I love their envelope covers/pocket diapers! Would love to try their washable nursing pads too, didn't know they made those! I loved the size 1 diapers on my 4 month old, unfortunately she is between sizes now and I can't get a good fit for her extra chubby thighs. I would love to try the size 3 on my 3 year old with the 3 ply bamboo inserts, the size two is just a bit too tight. I love the 2 size envelope cover in raspberry sorbet! So adorable! I like their Rayon from Bamboo Wipes. I love that they now have size 3!!! I love wingin' it so much! The sized envelope covers look great! I would love an AppleCheeks 2-Size Envelope Cover in any color lol they are all so adorable! I would like to try the 3 play bamboo inserts. Leaks during naptime aren't fun. I love the raspberry sorbet color for a cloth diaper, these are so nice! I love AppleCheeks 3-pli inserts. I only have three, but I use them every night. I love their envelope covers. I would take any color! I love the size 2 covers! I also really like the Washable Nursing Pads. I'd love to give them a try. Our daycare won't let us use cloth diapers, but I am intrigued by these swim diapers. This is just what we need! I like their envelope diapers. the purple/blue ones are so cute. i love that they have size 3!! that is fantastic! I like the envelope diapers, I think the St. Lucia color is adorable. I love their pocket diapers and really like that they make a size 3 now. Their covers! I'd love to get a size 1... baby #3 is due in the fall and I heard they work great for newborns! I love that they have AppleCheeks Waist Extenders. I have big boys so this is perfect for someone like me. We love Applecheeks diapers, the size 1 fit our daughter for a long time (could still get them one up to around 15 months) and were nice and trim compared to OS diapers, and I like that the size 2 will have plenty of room until potty training. I love their new "First Crush" diaper!!! I've been wanting to try their diapers! We love the size 2 envelope cover! The ruffles are just the cutest (and really work, too). I like the first crush diaper. I have a few size 2's but would love a swim diaper. All their colors are gorgeous! I love wingin' it !